Integrity —> to be congruent and live what we talk. We aim to integrate of the pillars of NLP and the presuppositions of NLP in our daily life, our actions and interactions with ourselves and with others. Ethics and ecology —> In actions and interactions with ourselves and others we use ecology check prior to making decisions or moving forward. High standard —> quality of clarity of standards in knowledge and skills. We have an agreed standard of knowledge and skills for: NLP Practitioner, NLP Master Practitioner, NLP Trainers (to be developed by the group/subgroup). Development —> We share all developments of NLP (perhaps there can be a forum on the web site for new developments/or new developments being tested). Accepting and practicing the Practitioner and Master Practitioner Standards. The traditional standards for 20 to 25 competencies were originally established by Leslie Cameron Bandler. Later we will seek to identify them in terms of benchmarks and measurements and decide on time frames. Professionalism —> In our daily work and practice of NLP we seek and use the best possible solutions for the client/coachee i.e. our own needs, ‘maps’ and wishes are held within ourselves and without consideration in the client/coachee contact. Contribution at global levels to the evolution of intelligence and wisdom (see 10 below). Clear and consistent communication at all levels of society. We aim to increase the general knowledge about NLP in the society, as well as contribute to research initiatives around NLP. We are open and receptive to any development and change as a result of research and development work in the area. Development of the human race. Given that NLP is about individual and organizational learning, growth, understanding, cooperation, etc. Neuro-linguistic Programming (NLP) is a field that explores how people effectively attain what they want (that is, succeed in reaching their objectives), the resources they need, and how to keep enhancing their ability to achieve their desired goals. NLP is the domain of study that explores the structure of subjective experience using the distinctions of communication (Meta-Model, Representation Systems, etc.) for the purpose of transfer expertise for personal development and actualizing what is potential. 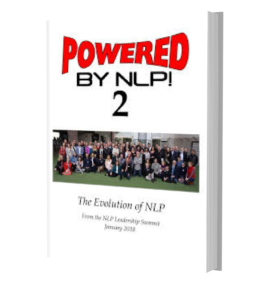 NLP is a domain that began, and continues to develop, by modeling experts. NLP models by using such meta-models as: Meta-Model of Language, Strategy Model, Meta-Programs, Meta-States, Sub-Modalities, etc. NLP is an attitude and a methodology which leave behind a trail of techniques that flow from the epistemology implied in the word “attitude: and the modeling structure. The “theory” of NLP is encoded in the NLP Presuppositions. We define NLP in these ways and distinguish NLP as such from the applications of NLP. While everyone is free to apply NLP in whatever way they think appropriate, those applications of NLP do not define NLP. For example, one may apply NLP to a religious faith like Christianity, but we do not recognize “Christian NLP.” One may apply NLP to the field of “energy,” but there is no such thing as “Energetic NLP.” We distinguish and separate applications of NLP from what NLP is and do not re-define NLP by an application. The attitude of NLP is an attitude of learning, curiosity, experimentation, discovery, and willingness to re-examine our premises. NLP is often presented in an over-simplified way for marketing purposes that runs the danger of being misinterpreted. The basic NLP attitude points toward the NLP Epistemology found in the NLP presuppositions and the structural elements (representations, sub-modalities, meta-programs, meta-states, and systems organization). The epistemology becomes attitude as it operationalizes the humanistic perspective (self-actualization psychology) of Rogers and Maslow. We often develop patterns of excellence through modelling excellent exemplars. Many modeling books in the field presents our key methodology. This highlights that our key methodology in NLP is modeling and this is an important aspect of NLP training curricula. Modelling is the unique epistemology of NLP, sensory-based calibration, the use of the Meta-Model of language, and other NLP tools. These allow us to create teachable and repeatable patterns for both positive and negative behaviors, so that we can replicate the one and modify the other. Those that apply almost independently of the individuals involved (V/KD, Spelling, etc. ); these may be subjected to standardized quantitative research methods. Those that require considerably more flexibility on the clinician’s part and which may need much more extensive manualization before they are subject to evaluation. Ethical means being in accordance with the accepted principles of right and wrong that govern the conduct of a profession. The NLP Leadership Summit has focused on our desire to build a more professional and ethical field. So we have included several other words as additional values in this category. The follow are suggestions for how we might apply the idea of being ethical to our values statement and tying them in with integrity and ecology. We are ethical as we care about the importance of ecology for both individuals and organizations. We are ethical when we are clear about what NLP can and cannot do based on reliable, reality based evidence. We are ethical when we adhere to professional standards of behaviour and practice. We are ethical when we accept personal accountability for our behaviour. We are ethical as we recognise the importance of an impartial professional body to investigate complaints. Integrity is steadfast and uncompromising adherence to a strict moral or ethical code. it is being sound in moral character; being honest. It is the state of being unimpaired. It is the quality or condition of being whole or undivided. Integrity can include being true to yourself, doing what you say you are going to do and when you say you are going to do it. It is living in a congruent way to our beliefs, words, and promises. Steadfast and uncompromising adherence to a strict moral or ethical code. Maintaining honesty at all times. The profession (at least Leadership Summit Members) speaks with one voice, recognising the importance and benefit of putting aside areas of minor disagreement for the benefit of all members and users of NLP services to enhance NLP’s contribution to humanity. NLP Leadership Summit members agreeing to act with integrity. Credibility, as being capable of being believed, in this context means doing things which enable NLP to be believed. Because different organisations in different sectors will do different things for this, credibility entails many things: Being professional, researching and testing, evidence, being robust and rigorous in presentations, being reality-based, accountable, effective in results, clarity in communicating and educating, etc. A level of consistency in the practice of NLP across the NLP trainings— NLP Practitioners, Master Practitioners, Trainers and Master Trainers. This includes consistency of evaluation of students across training organisations. Commonality in terms of the time-frame and criteria for delivering NLP Trainings (Practitioner and Master-Practitioner). The details of this has not yet been decided upon; it will be discussed and debated in coming Summits. NLP practitioners role model the Pre-suppositions of NLP and demonstrate excellence in all of their communications, both personal and professional. Representing NLP in the peer reviewed literature of the sectors and domains in which it is practiced. Developing a recognised appeals procedure and ethical framework applicable for all members. Supportive means providing moral or emotional support. In the Leadership Summit discussion, supportive as a value has several layers. On the first level, supportive means kindness, compassion and warm-heartedness. On another level, it means co-operation, collaboration, and respecting differences. It also means contribution to our communities. 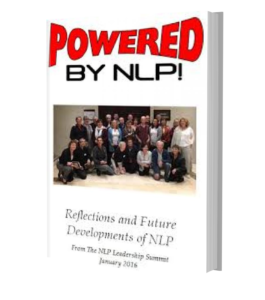 We embody the NLP presuppositions as we hold positive representations of each other, our clients, and other members of our profession. We demonstrate compassion and kindness even when we disagree with each other at a theoretical or personal level. We accept that our sense of reality is our perception and that there many perceptions can co-exist. We embody the spirit of co-operation and collaboration as we share good practice and are willing to give and receive feedback regarding our professional practices. We ensure that we are inclusive and open to and with new group members. We are willing to make a contribution to our community and beyond by committing to take action to support the ideas developed within the Leadership Summit. Respectful refers to the attitude of treating others with honor or esteem, with feelings of appreciative, and unconditional positive regard. It involves the willingness to show consideration or appreciation. Clearly demonstrating a positive regard for other people and their points of view, even when we disagree with them. Clearly demonstrating consideration and appreciation of other people’s opinions, recognising their right to have a different point of view. Co-operating with other people for the betterment of the human race.